Dengue fever is a tropical virus that causes an extreme fever and rash. 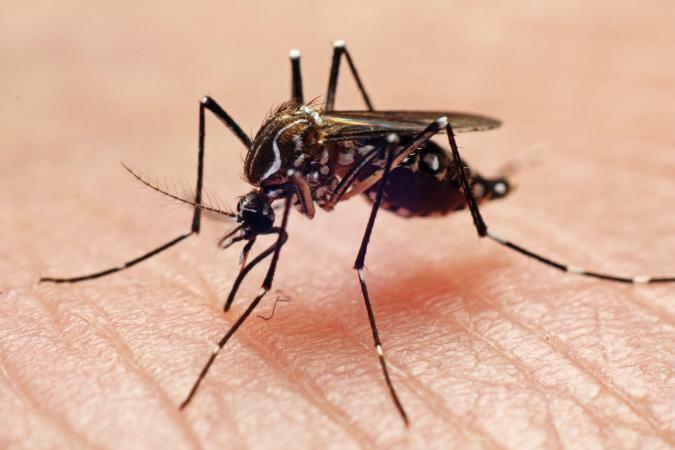 It is contracted by the bite of the Aedes mosquito, which can spread many different forms of the virus. These strains mean those suffering from one form are still able to contract another equally serious strain. Mosquito bites are a known hazard when traveling to a hot climate. They can cause a wide array of diseases and should be avoided at all costs. Unlike mosquitoes that spread malaria and other illnesses, the Aedes aegypti do their work during the day. This makes it difficult to avoid being bitten. The signs of a hazardous bite may appear two weeks later, however, according to the Mayo Clinic, they typically arrive within four to ten days. It is best so seek medical evaluation and diagnosis when the rash appears. Although Dengue Fever can be treated at home, it is wise to seek the advice of a physician to get a diagnosis and prevent complications. These symptoms should always be taken seriously, especially if you've been traveling in an area with a known risk of dengue fever. Typically, the disease presents itself in two forms: Dengue fever or Dengue hemorrhagic fever. The latter is a far more serious and often fatal form of the virus. 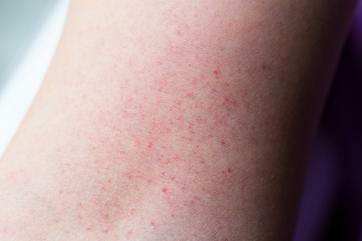 The Dengue fever rash often shows up a few days after the initial symptoms. It is not uncommon for the rash to appear twice: once in the initial stages and a second time later in the disease. 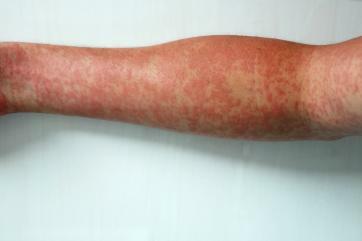 The Medline Plus article on Dengue Fever states the second rash tends to look like the measles. 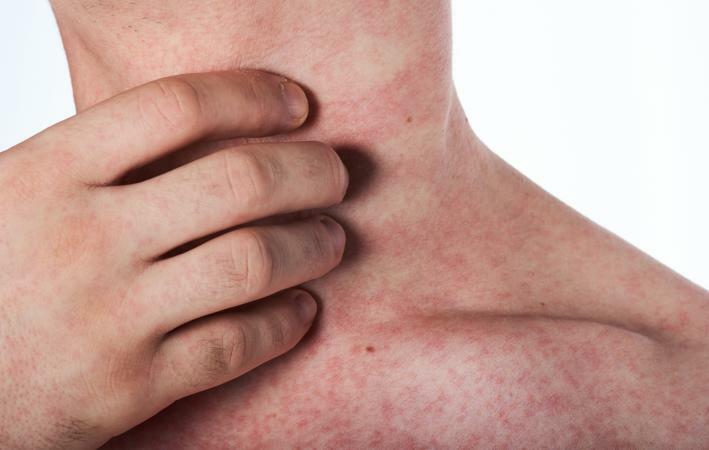 Before the main rash appears, an individual may experience a lesser rash, giving them a flushed appearance. However, there are three recognized Dengue rashes - and they all appear at some stage of the infection. With Petechiae rash, bright red dots show up on the skin's surface. Usually found on the limbs, this rash is a result of bleeding underneath the skin. It is not always itchy, tends to be flat, and does not lose color when touched. A bright red rash is the second rash, in which the skin becomes florid and bright red in appearance. The redness is dominant although there will still be normal areas of skin that are unaffected. Lesions occur in the third rash. It has either flat or raised red lesions on the skin. It is a far more obvious rash than the other two. The skin rash itself is often very itchy and the affected areas can peel. At the stage when the skin begins to peel and is no longer red or sore, the application of a simple fragrance-free moisturizer will help things return to normal. The cause of dengue fever rash is simple: a mosquito bite. There are four different (but related) viruses that the Aedes aegypti mosquito carries that can result in the virus. Not all mosquitos are carriers, though, and certain areas of the world put you at a higher risk. According to Medical News Today, the disease is most often found in tropic and subtropic areas. That includes South and Central America, Southeast Asia, Sub-Saharan Africa, northeastern Australia, Indonesian archipelago, and parts of the Caribbean. Avoid travel to areas with the disease. Certain areas have peak times of the year where Dengue carrying mosquitoes are high. Additionally, some countries experience unexpected outbreaks. Before you travel anywhere, do your research. The Dengue Map from Health Map provides updated information on where the disease is present. Wear mosquito repellents. Most travelers to tropical climes will do this no matter what, but the use of effective bug repellents cannot be stressed enough. Use something like Repel Insect Repellent to prevent contracting a serious disease or virus. Cover up as much as possible. It is sensible to wear lightweight clothing that covers most of the body. Often in tropical areas where is it hot and humid, travelers do not do this. Showing skin may increase your risk of getting a mosquito bite. Make use of nets and bedding. The use of mosquito nets and appropriate bedding is a worthwhile preventative measure. In many countries where mosquitoes are common, such things are available in hotels and hostels. As with many illnesses caused by mosquito bites, adequate prevention may help you avoid contamination. Those traveling to areas that may be affected by disease-carrying mosquitoes should always do extensive research beforehand. When it comes to treating dengue fever rash, there is no specific medication that will rid you of the disease. It can be diagnosed with a blood test, and it is best to get an evaluation from a physician when the rash first appears to help prevent possible complications. Medical attention may be necessary if complications do occur or if symptoms are severe. For the most part, however, it can be treated at home. The fever itself should be treated and managed with acetaminophen. Avoid medications with aspirin, as they may worsen bleeding. Take care of the rash. Though there is not specific treatment for a dengue-related rash, soothing skin lotions such as Calamine lotion can provide some much-needed itch relief. If symptoms worsen after the fever goes down, visit the hospital immediately. This may indicate a complication or a more serious strain of the dengue virus. If you love to travel (or plan to spend time in a tropical location) then take the necessary precautions. Understand where the high-risk areas are and do your best to avoid insect bites. With a bit of planning and preparation, you can see the world safely.